Our SMARTbook series has been fully UPDATED & REVISED with the Army’s latest “Doctrine 2015” doctrinal publications (ADP/ADRP/ATTPs)! We have completely updated and revised all of our Army-based titles with up-to-date material from the latest Army ADP/ADRP/ATTP doctrinal references, including all “pen and ink” reference citation and terminology changes! Under the previous doctrine management program, the Army maintained 625 publications on the Army Publishing Directorate website and the Reimer Digital Library. Many of these manuals remained unchanged for years. In 2009, the Commander, U.S. Army Training and Doctrine Command (TRADOC), directed a reengineering of doctrine. The primary goals of the reengineering project were to reduce the number of field manuals (FM), standardize the content of manuals to less than 200 pages, and establish a more efficient doctrine management program. Under Doctrine 2015, Army doctrinal information is being broken down into its components, making revision quicker, but without losing enduring principles. Doctrine 2015 has four categories: Army doctrine publications (ADPs), Army doctrine reference publications (ADRPs), field manuals (FMs), Army techniques publications (ATPs) and digital applications (APPs). The Lightining Press is committed to providing the best and most relevant doctrinal material to our readers and are vigilant in reviewing new publications, anticipating upcoming doctrinal releases, and looking at ways to incorporate the material into our SMARTbook series! 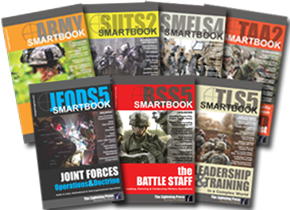 Because our SMARTbooks are based on groups of related official military publications, our goal has been to keep our books as up-to-date as possible by planning revisions following changes in the “core set” of manuals upon which a particular SMARTbook is based. It generally take us a 4-6 months to research, compile and produce a new or revised title once the “core set” of doctrinal manuals have been made publicly available by the Services. With literally hundreds of Service publications all in various stages of publication by numerous, diverse organizations, and now a complete re-engineering of the Army’s doctrinal series, this is no simple (or fast) task. SMARTbooks – Intellectual Fuel for the Military! SMARTbooks: Reference Essentials for the Instruments of National Power (D-I-M-E: Diplomatic, Informational, Military, Economic)! Recognized as a “whole of government” doctrinal reference standard by military, national security and government professionals around the world, SMARTbooks comprise a strong comprehensive professional library designed with all levels of Soldiers, Sailors, Airmen, Marines and Civilians in mind. SMARTbooks can be used as quick reference guides during operations, as study guides at education and professional development courses, and as lesson plans and checklists in support of training. Serving a generation of warfighters, our books have spanned the globe with more than 500,000 copies sold. Browse our collection of Military Reference SMARTbooks to learn more! About SMARTbooks…the Essentials of Reference!